I haven’t written on here for a while, but there is plenty of exciting news to share. 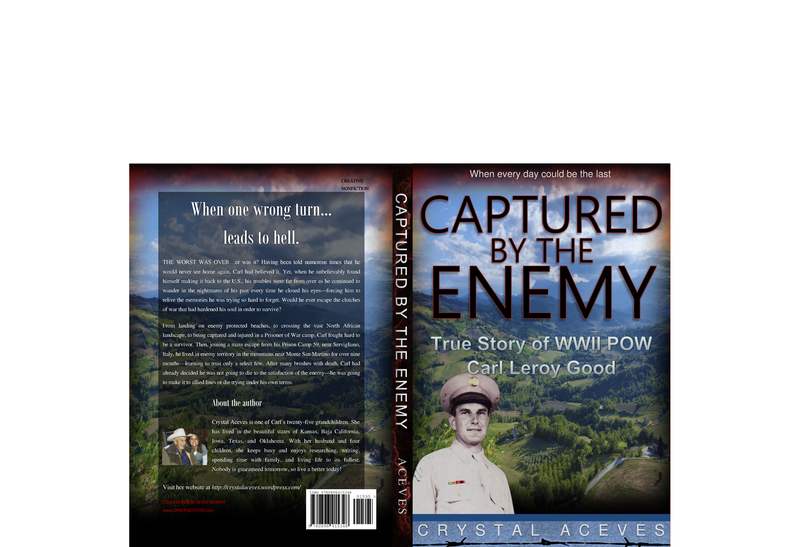 I have worked on writing a book about my granddad’s WWII experiences since 2008. Although I haven’t had large amounts of time to work on it at a time, I have finally finished. Thanks to a contest put on by http://www.bookbutchers.com, I won an edit to finalize it before publishing. Burning the midnight oil, I made a goal to have the book ready for edit by Oct. 1–and it was! The exciting news is that it should be edited, formatted, and ready to publish by the beginning of December. Yay!! After working so hard, I am finally putting an end to all the research and writing. I also used http://diybookcovers.com to design my own cover. It turned out Fantabulous! 🙂 Now, the countdown can begin. Here’s to a December 1, deadline. What do you think? Here is the full book cover spread. I love it! Based on what you see here, take this short poll. Thanks!